This is a series using quotes and perspectives from Cokesbury insiders as to why the official bookstore of one of the largest Protestant denominations that for decades contributed its profits to the Pension fund…chose to shut down and close its brick-and-mortar stores (including seminary stores) by May 2013. In our last post, we talked about the problems of an automated catalog and how it diminished pastor’s ability to support Cokesbury offerings unconditionally. Some commenters on here and on Facebook contended that Cokesbury local store has no control over that. They are right. While we are talking about closing the local stores, rest assured that the list of posts I have coming set their sights squarely on the upper management of United Methodist Publishing House. Books are not items with a large margin. Books which pastors received a 20% discount on in the store (which was a discount all received online) typically have somewhere between a 36-42% mark up. Add in shipping, costs of people, time, insurance . . . this is why online does so well. Amazon sells at a loss sometimes; sometimes Amazon is able to negotiate great deals for a large order. This is true also for Cokesbury. It’s much easier to sell at loss online. It’s much easier to store product in a centralized warehouse and ship out as needed than to employ people at 50 some locations. Books are considered “worthless” in system after about 2/3 years; the cost of returning unsold product builds up if each of the 50 locations are returning the product. In short, the numbers are fiscally stacked against any destination store without an extremely loyal base. So I really feel for local stores that need to (1) turn a profit and (2) provide resources for local churches. By any measure of accounting, the business model of bookstores is a tight one. While megastores and huge online retailers can supplement by volume discounts and by loss-leaders, local bookstores have a hard time doing that. My difficulty is not with the local store. My difficulty is with the upper management that by many accounts centralized decision-making and removed the ability of local store managers to adequately lead. Advertising is another issue. If you won’t advertise locally, other than direct mail that is only going to people who already shop in your store, how do you expect to find new customers? To me one of the issues is buying of gifts and novelty Christian items, your cross necklaces, Jesus plaques, and various other Jesus stuff. It is where you can have the highest mark up on items by far. The best selling item in my store while I was there was .25 cent wooden cross key chains. They cost us 6 cents. 19 cents times 5000 is more profit than many books where the profit after discounts is probably just pennies as well. My manager was great at finding this crap but they stopped allowing store managers to purchasing gift items a few years ago. Instead Nashville decided they knew what the people would buy. Centralizing the buys and relying on inventory requests from local stores is the industry standard. I get it. However, trusting that your employees are doing their jobs (even at minimum wage) and responding to their requests in a timely fashion is the oil that makes that industry run. By outsourcing the management of key decisions away from the local store, the Executives essentially were telling the local stores to not lead. Let’s be clear: The point of this conversation is not to point fingers but to enlighten our own struggles. Cokesbury’s problems are our problems too. The worst response an organization can make to instances of human error/greed is to make personal failings into corporate policy. 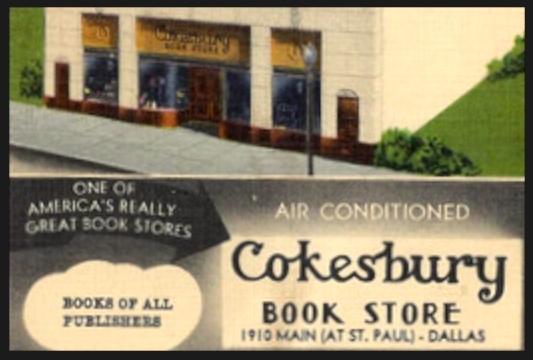 In Cokesbury’s past, there were bad store managers who made grievous errors in purchasing items or advertising decisions. So removing that ability became an overall policy — a few bad apples ruined the leadership abilities of the whole. How many churches have serpentine authority processes because of bad apples or abuses of power in the past? I’ve served three churches and each has strange rules that removed powers that were supposed to be in one committee or entity and placed them in another…because of abuses of power in the past. I served one church that required every expenditure to be approved by the Finance committee…because a pastor previously had been brought up on charges and removed. I served another church that gave full authority to the clergy to spend up to the budget amount…but would never get a credit card for the church so expenditures had to come out of the clergy’s pockets until they were reimbursed. Other clergy have similar breadth of experiences when it comes to financial decision-making. Trust often must be earned especially as strangers work for each other. However, the trust must also be balanced with the flexibility to respond to one’s environment. In our brave new world, organizations will do better by decentralization rather than centralization–by suffering the small consequences of trusting the lower rungs of hierarchy–rather than turning personal failures into corporate/church policies. My hope is that as more institutions of the church are threatened by lower metrics and smaller cash flow that they react as Starfishes, not Spiders. Because, in this series, we’ve seen what happens when you go all Spider, haven’t we? Part I: To Consolidate or Decentralize? This is the a series of posts including comments by Cokesbury insiders, employees at the local stores and at the mothership. My goal is not the denigrate the past decisions but to help laity understand the importance of Cokesbury and what role it has played in our history. I welcome other comments if you want to remain anonymous. Send comments to my twitter handle at gmail.com and I will respect confidentiality. I appreciate that you point out that these are not merely the problems of Cokesbury Retail stores but the problems of the denomination as a whole. They are our problems particularly in a world, where I, like may others, am increasingly inclined to become one of the many folks to leave the denomination and wonder why I need organized religion at all when I can get what the church offers elsewhere. Well, SOMEONE pointed out that I was being unfairly critical of Cokesbury, so I thought I would nuance (a) what I was properly critiquing and (b) how it can inform other areas of the church.